One of our members was victimized by an Unorthodox underdrive pulley installation gone awry. Before getting into the gory details it should be said upfront that there is nothing at all wrong with the Unorthodox pulley itself - in fact it is a very nice piece, It's light, machined from billet aluminum and has a nice finish. It performs exactly as advertised. The problem is it is VERY VERY difficult to install correctly. Even the professionals have had their fair share of problems. And the only indication of an incorrect installation is a slight wobble in the pulley when the engine is running. Then after a few thousand miles of use all hell breaks loose. Read on if you dare! Our victim installed the Unorthodox pulley and had the telltale wobble and decided it was worth the effort to see if this wobble was truly an issue. But first a little background. To install the Unorthodox pulley the old pulley must be removed. This consists of the pulley itself and the hub the pulley is bolted to. 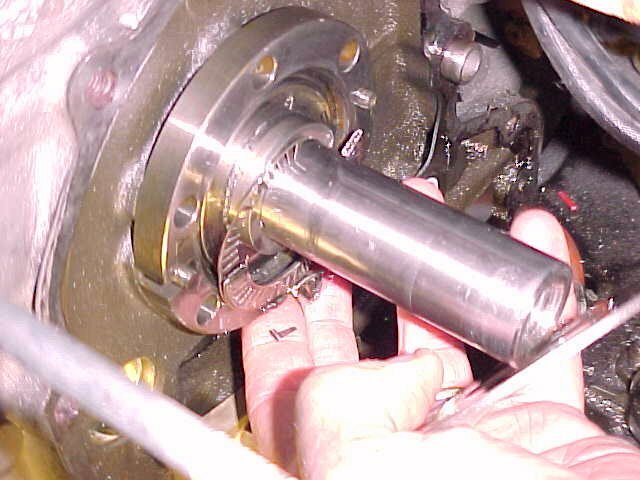 This hub is held on the end of the eccentric shaft by one big bolt. 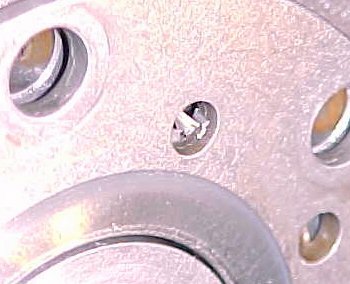 This bolt not only holds on the hub but also holds in place a whole series of bearings, races, and oil pump hardware (gears and chains). What happens is when this big pulley hub bolt is removed, tension is lost that holds all this hardware in place. The eccentric shaft bearings then drop out of position so when you go to bolt it all back together and turn the engine over... hey presto one big chewed up mess. Sure the engine will run, but it won't run for long. 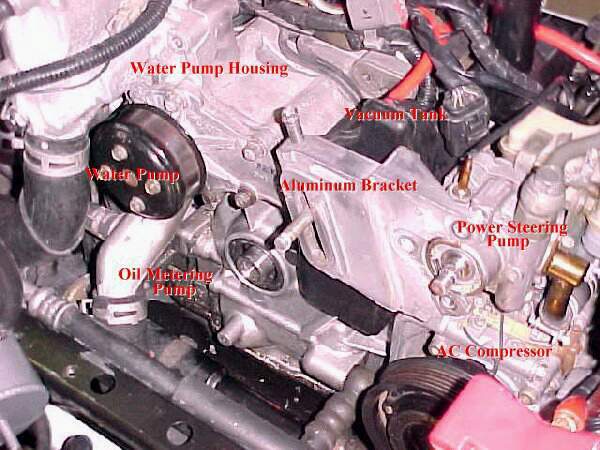 First you need to take all your patience and remove everything from the front of the engine. Also, you need to remove the oil pan to do it correctly. To give you an idea of the extent of work needed to fix this mess the workshop manual it tells you the motor needs to be removed! However, our victim successfully performed the work with the engine in the car. Disclaimer: This is NOT an all inclusive instruction - merely a guide to provide insight as to the severity of damage that can occur. Ok Lets begin....remove the following: Aircleaner and all hosing from the intercooler and piping, intercooler, alternator, water pump housing, oil metering pump/harness/oil lines, power steering pump, ac compressor, aluminum bracket for the above mentioned, oil cooler line from front cover, vacuum tank. Now we get to the heart of the problem: Remove the needle bearing (which has probably been destroyed) and the front bearing support for the engine with six bolts in it. Remove the bolts. Is that a needle bearing in there? Visible through holes in the front bearing support. 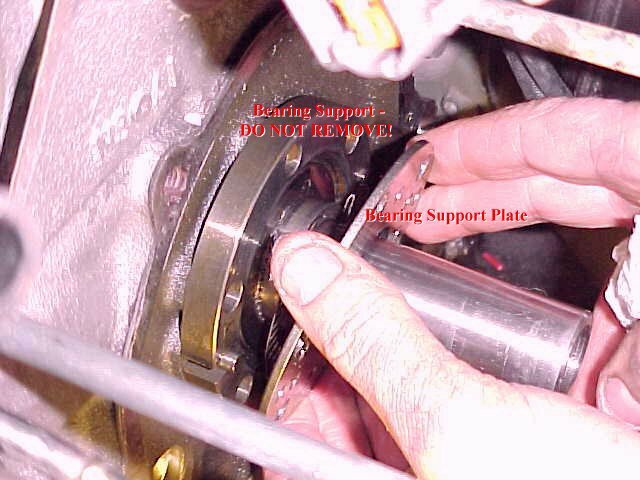 Notice how the bearing has "dropped down." Removal of front bearing support plate. Remains of inner needle bearing. 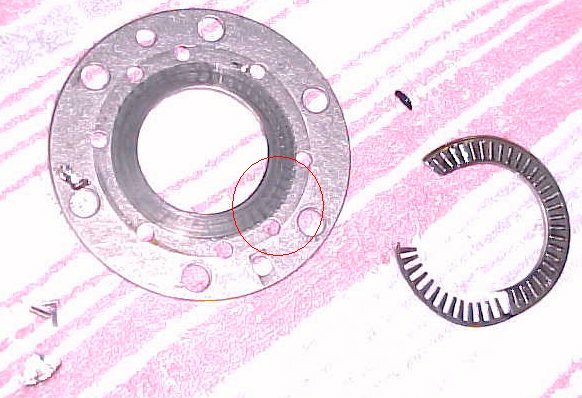 Support bearing plate - notice chatter marks (circled) and few remaining bearings. Where did all the bearings go? Most were fished out of the oil pan but it is presumed that some were simply ground up and will eventually be caught by the oil filter - one hopes. 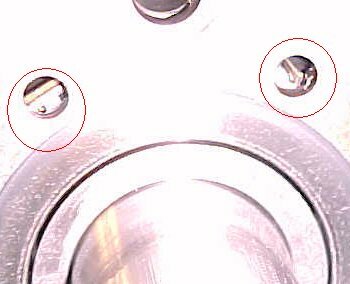 Once you have all your new parts (about $130.00 worth), install in the following order: Most importantly is to slide the small collar on first, all the way against the bearing support Install the needle bearing with vaseline. Then the plate with the bolts (loctite on the bolts) Then the other needle bearing. Counter weight. Oil pump chain and gear and the the drive gear for the metering pump. 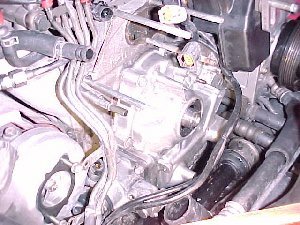 Note: when the gasket for the front cover is reinstalled there is also a plastic ring and o-ring for the oil passage between the front cover and engine. 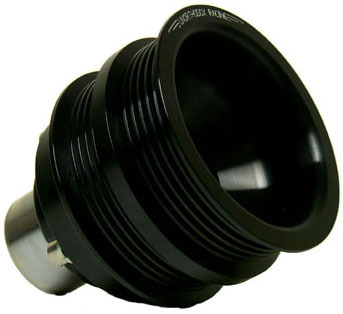 Attach this to front of the engine with Vaseline, making sure it stays or you will loose all oil pressure. Yikes! Once you got the front cover on the first thing to do is install the pulley and bolt. Torque it down and then install all the rest in reverse order.